Here's a farmyard frolic that will have kids quacking, oinking, and hee-hawing along with a cast of adorable animals. 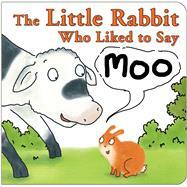 The fun begins when Calf hears Rabbit out in the field mooing—and feels inspired to give a great big BAA. Why? Because he likes the sound! Before long, Lamb, Piglet, Baby Donkey, and all the other creatures on the farm realize they're not limited to their own language, but can enjoy experimenting with others. The cute surprise ending shows that Little Rabbit—who started the delightful chorus by thinking outside the box—still plays by his own rules. Thanks to Jonathan Allen's wonderful illustrations and engaging join-in text, this will become a favorite that kids will read again and again. Jonathan Allen has created many wonderful picture books for children, and his international success is based on his observant wit, appealing art, and childlike sense of fun. He lives happily in a quiet village in Cambridgeshire, England.